Many homeowners use their garage as storage for household bric-a-brac, not just as a parking space for vehicles. However, what often happens is that homeowners store too much of their things in the garage without any organization. This scenario often results to clutter and waste of precious storage space. Because of this clutter, the space in the garage is not maximized. A lot of space in the garage can be converted into a storage area. But in order for you to fully maximize the use of the garage as storage space, you may need to free up more space and introduce more storage areas by installing a garage storage system. There are a number of great ideas you can adapt when converting your garage into an organized and fully-maximized storage area. In this article we will explore some of these ideas to help you utilize more of your garage as storage. There are many garage storage systems available on the market. If you are running out of space in your garage and you need additional storage space for your things, these storage systems can help you in many ways. Installing cabinets in your garage may be the best thing you can do. These cabinets help you increase storage space in your garage many times over. Cabinets come in various designs and configurations you can choose from. A cabinet is the best place to store hazardous items and substances such as chemicals and pesticides, to keep them out of your children’s reach. There are free-standing cupboard-style cabinets that can handle overflow of objects from your house. There are also kitchen cabinets that can be installed on the walls just like kitchen cabinets. A good tip is to buy cabinets that have caster wheels to facilitate moving around. This cabinet-on-wheels makes your garage storage system more versatile. 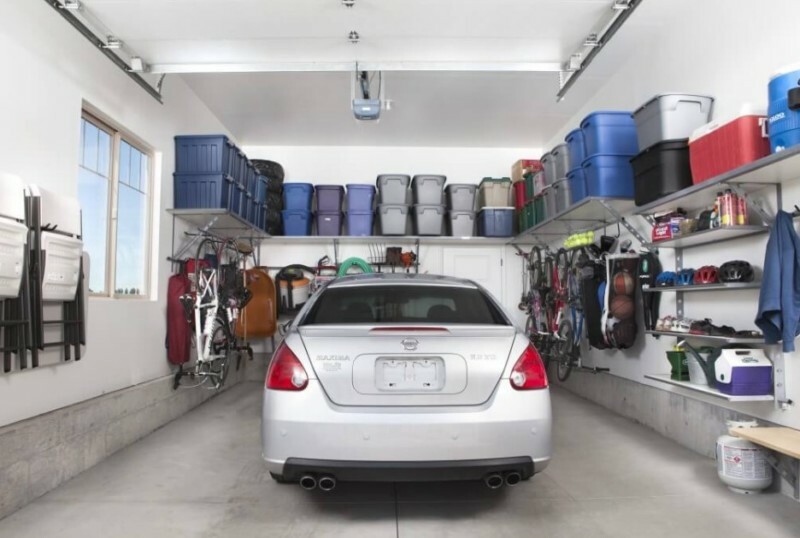 Your garage’s ceiling provides a wide area of unused space that can still be utilized as storage space. You can install overhead storage systems such as racks on your garage ceiling. This is an excellent storage space for seasonal items including decorations. Storing items near the ceiling is also a good way to keep the garage looking neat and clean at all times by keeping items off the floor. Storing your items overhead will surely free up space on the floor which can be utilized for working. For frequently used items such as household and garden tools, instead of storing them in bulky tool boxes, why not hang them on hooks and hangers on the walls of your garage. This allows easy access and makes your important tools easy to find from among the huge amount of items in your garage. Irregularly shaped objects such as kayaks or bicycles are best stored using hooks and hangers. Anything from garden tools to your children’s pram can be stored using hooks and hangers. This type of garage storage system also allows easy access to frequently used items. Shelves come in a wide variety of sizes, designs, and materials making them the best choice if you are looking for less expensive but very useful storage system for your garage.